Purchase your tickets in advance for our biggest celebration yet... the BIG 1-0! Limited amount of tickets available for general admission and VIP. Can you believe we are in our double digits!? With over 600 dogs saved, hundreds of events, many many miles driven, fantastic fosters, amazing adopters and out of this world volunteers we have reached this huge milestone. 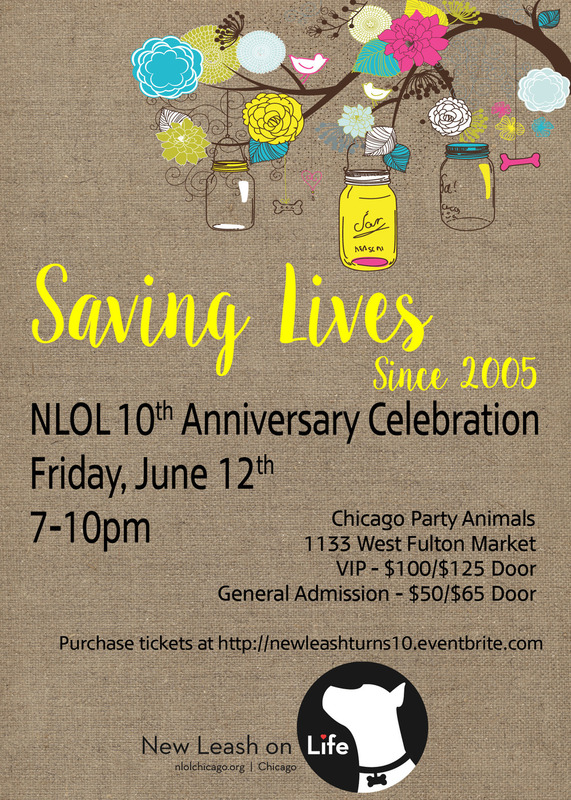 We hope you will help us celebrate in style at the amazing Chicago Party Animals venue. This place is a lofty, amazing location, fantastic views and the perfect spot for us to celebrate! General Admission ($50 in advance/$65 at the door) Includes: Live Music by Blackest Crow (https://www.facebook.com/BlackestCrowband?__mref=message_bubble) Heavy Appetizers 2 Beer/Wine tickets (more available with donation) Photo Booth access to remember this fantastic night! Several months ago, one of our volunteers watched in horror as a van rolled over a dog and drove off. Being the awesome New Leasher that she is, this volunteer acted quickly and brought this stray to our vets for intensive treatment. We were thrilled when Bo made a seemingly full recovery. Once we got him out of the vet and in to a loving foster home, Bo's personality totally changed. This 9 month old guy is a total goofball, a lover of toys, and a great companion for his human friends. We were so happy to make him officially one of our New Leash on Life dogs. Throughout Bo's journey from critical condition to adoption event star, we have been committed to providing him with the medical attention that he has required. After his accident, Bo could not put weight on to his front legs. But with vigilant treatment and therapy, Bo seemingly made a full recovery. As time has passed and his scarred face has healed, we were dismayed to see that while his right leg improved, his left front leg has continually bothered him. With the help of our specialists, we determined that the radial nerve damage is too much for this active and lively pup. Because of this, he continues to injure his injured leg by favoring and overdeveloping the muscles in his other legs. After multiple and lengthy discussions with all parties involved, it was decided that Bo would require amputation of his left leg in order to give him the best quality of life. Bo's journey will not be made on the traditional four legs. Instead, this guy will be going his own way on three strong and healthy ones. His lack of a limb will be tangible proof that he is a survivor. He is a shining example that anything can happen with the right people, a lot of love, and a whole bunch of determination. New Leash will be supporting Bo through it all- including the costly medical procedures and therapy . As a 100% volunteer run nonprofit, we ask that you considering donating to our cause. Whether it is good wishes or monetary support, you can help us make Bo's journey to a forever home happen today. Remember this super fun event?! Well, it's happening again! Mark your calendars: February 27th 7pm at 5400 N Clark Street, Chicago. Hamburger Mary's will be hosting BINGO NIGHT with all proceeds going to New Leash on Life. Bingo cards are $5 each or 5 for $20. They will also be serving $2 jello shots. All proceeds from bingo cards and jello shots will be directly donated to New Leash on Life. Don't forget about the amazing and talented performance and singing by drag queen Mary! Hamburger Mary's was pretty full last time, so please come early and help homeless dogs! Happy Valentine's Day from New Leash On Life! New Leash on Life Chicago would like to wish you and your canine loves a happy Valentine's Day! Thank you for all the love and kindness our volunteers, foster families, adopters, and supporters show our dogs throughout the year! Scrambling to find the perfect gift for your sweetheart? Look no further! We have several pairs of tickets to the following 5 upcoming concerts at House of Blues Chicago. With each donation of $40+ online, you'll get to pick your concert tickets and watch your honey swoon at how you planned a fun night out while helping save homeless dogs at the same time! When donating online, write the name of the show in the "description" line on the form. We will confirm that you've won the requested tickets within 1 day of your donation by email. If your top choice has sold out, we'll offer you tickets to another show. If you want to verify the tickets of your choice are still available before donating, or if you have any questions, just email amber@nlol.org. On behalf of all the dogs saved and those still dreaming of rescue, thank you for your support! PS. We just picked up 5 new adorable pups that will be making their debut very soon! Levi's eye surgery went well and we couldn't have done it without the amount of support we received from everyone near and far. We were overwhelmed and humbled by the turn out. Thank you, thank you thank you. You can read about the whole story on his blog here. Little Levi sends his thanks as well! Remember these?? 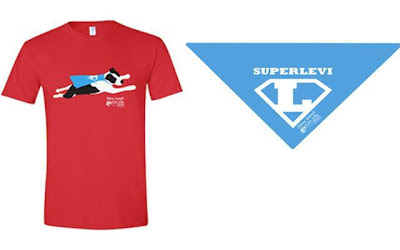 If you ordered a Super Levi T-Shirt but either didn't get one, or it never got picked up, please email Jenna at: jennanlol@gmail.com to claim yours!! THANK YOU! 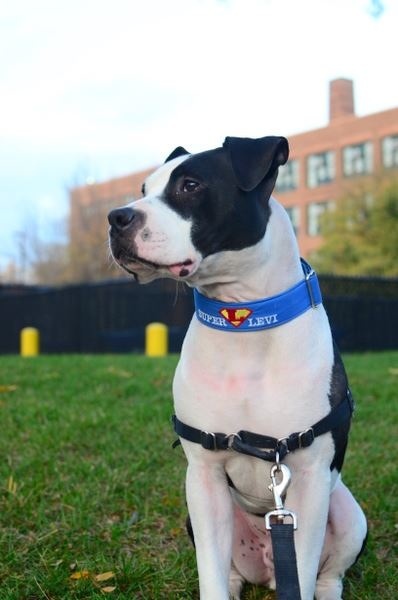 We always joke that our fosterdog, little SuperLevi ,was raised by Superheros. And while he is always trying to help us if he thinks we're in distress, and charm the seemingly eternally grumpy Miss M, we realized that little SuperLevi actually needs our help. Quite by chance we discovered that Levi has a congenital eye condition that will effect his vision in the near future. He is not in any pain, and he does not have any vision loss at this time, but left untreated he will lose vision in the future. We were so devastated to hear this, especially as he is so young. But the good news is, there is a corrective surgery that will make him as good as new. The bad part: this surgery will cost about $2,700 (at discount!). Want to support Levi in his search for his X-Ray vision? Interested in getting a unique, limited-edition shirt, and snazzy bandana, that will help support Levi? If you purchase 2 T-shirts, you will get one raffle ticket! We would love to see you walking with your pooch in your own area in Levi's honor. Just like on New Year's Eve where they check in to all areas of the country, it would be great to see photos of people from all over posting photos on Facebook wearing the T-shirts and bandannas on the day of the local walk and walking in his honor. If you would be interested in buying a shirt: you can make a tax-deductible donation on the New Leash site. -1 Shirt & 1 Bandanna is $33, including shipping within the US. -Extra Bandannas are $15 each. -In the 'description box' make sure to include your preferred T-shirt size. -Please order by Thursday, November 3 to make sure you receive your items in time. We have a limited quantity, and shirts will be available as long as quantities last. We will be having a fun renegade,Superhero-themed walk for Levi the weekend of November 12. We would love to have you join Levi, Miss M, and Mr. B to walk to find Levi's X-Ray vision. --1 Shirt & 1 Bandanna is $30, extra Bandannas are $15 each. -You can purchase by making a donation clicking here. -Please order early. Shirts will be available as long as quantities last. --You can pick up your shirt at the walk, or by arranging to pick it up at a NLOL adoption event. Other Ways to Help:1) Please, please spread the word and share on your Facebook page or blog. 2) Any type of donation would be greatly appreciated. Levi's rescue is an all-volunteer rescue so all donations go directly to the pooches. New Leash on Life also seeks to help the under-represented pooches and has been so successful finding many homes for senior dogs, bonded pairs, deaf dogs, and many pit bulls (including Miss M!). They function solely on donations and are dedicated to giving dogs the medical care they need as they search for their future families. 3) Check our blog tomorrow as the pooches host a raffle including brand new versions of their favorite things. Again, thank you in advance for your support. Special thanks to Frances Almeda for creating our amazing T-shirts and bandannas, Aleksandra for the creative ideas, Claudia for jump starting everything, Kelsey for being so inventive and organized, and all the great people at New Leash on Life and SociaBulls for helping pull things together. Please make sure to check our Facebook page for updates!